This project concerns an independent house with garage in the annex building. When the owners purchased the building in 1996, a renovation was already being executed. Contrary to the previous owners, the new owners preferred a low energy renovation which started two years later in 1998. Due to urban development disputes the renovation was delayed, but around Christmas 2004 it was finally completed. 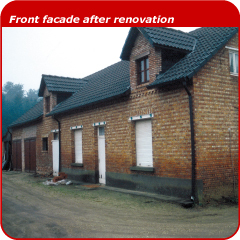 Because of urban development stipulations the owners were constrained not to exceed the existing volume and to preserve the existing/original window openings. For energetic reasons the dormers were removed. The house is equipped with a system of balance ventilation with heat recovery which ensures the incoming air is heated by the outgoing air and thus allows a reduction of the heating demand. Because the building had already been renovated just before the start of the passive renovation, the architects decided to stay on the safe side and installed different systems. A floor heating system powered by solar collectors was intended to heat the sanitary hot water, but since the collectors winter performance was insufficient, this solution turned out to be unprofitable. If necessary a condensing boiler will step in. In addtion a fireplace (wood) was installed in the living area. Sanitary hot water is heated by solar collectors mounted on the roof of the building. In the winter period the condensation boiler will guarantee its heating, considering the solar collectors poor winter performance. A large part of the electricity need is produced by photovoltaic cells mounted on the garage roof. The annual energy consumption is less than 3000 kWh, more than 2000 kWh of which is produced by the photovoltaic cells.